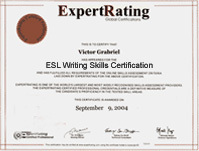 (leading to ExpertRating ESL Writing Skills Certification). About the ExpertRating Online ESL Writing Course instructor : Dr. Sabri Bebawi has been a college teacher for almost 20 years, educating students at many colleges and universities. His educational background includes law, journalism, and English education, with a Ph.D. in education and instructional technology. Dr. Bebawi has worked as a journalist in Europe and in the United States, writing on a wide range of topics. Online ESL Course requirements: For taking this instructor led ExpertRating Online ESL Writing Course you need A basic understanding of English grammar; Internet access, e-mail, and the Netscape or Firefox or Internet Explorer Web browser. "Dear Dr. Bebawi, This course was an awakening for me. Before I took this course, I had problems with writing and speaking in English. Today, I have completed the course, I have discovered my weaknesses. I will use all the information which I have learned from this course to improve my English skills. I also realize that I have much work to do to move up to the next level. I will not stop learning. Thank you very much for your teaching, Dr. Bebawi." "Dr. Sabri: I want to tell you, "thanks" for this course. I am discovering my weaknesses, and I am trying to improve in my writing of English. This course is valuable for me because it put to me on the right track. See you in another course that I am thinking of taking." "Wow, I really enjoyed taking this course, I've learned a lot, I got the answers for a lot of doubts I had. I loved the way you explained everything, you made it all as clear as possible. Thank You Sabri, because I completed my final exam and I reached my goal...100 % on my score, I was shocked!!! I would recommend this course to my friends, and I would like to take more in the future. It was my first time taking an online course and I liked it." ExpertRating is one of the world's only ISO 9001:2015 Certified companies (from TUV America) offering an Online ESL Writing Course (leading to ExpertRating ESL Writing Skills Certification). When you choose the ExpertRating Online ESL Writing Course you can be sure that you are buying a premium International certification that is recognized by hundreds of employers and Government bodies in the US and other countries. With ExpertRating you get certified quickly online and you are equipped with a store house of information through the in-depth ExpertRating Online ESL Writing Courseware which has been developed by experienced International Language Experts. The ExpertRating Online ESL Certification is by far the best value for money instructor led ESL Program at $129.99. You can buy this ExpertRating Online ESL Writing Course leading to ESL Writing Skills certification at a special offer price of only $129.99 which includes the in-depthExpertRating Online ESL Writing Courseware and exam fee. 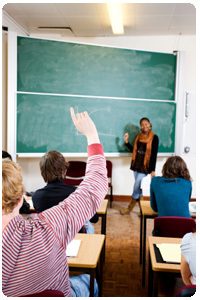 This is the best value for money ESL Program available till date. You get the following services within the USD $129.99 fee. In-depth ExpertRating Online ESL Writing Courseware including scenarios and case studies. The process of getting yourself certified is very simple. All you have to do is buy the ExpertRating Online ESL Writing Course for $129.99. Log in to the instructor led course using your password. Go through the ExpertRating Online ESL Writing Courseware (which would take you 6 weeks) and complete the final Online ESL Certification exam at your convenience. You can complete the exam within 2 months of buying the ESL Certification. The result of the exam appears as soon as it is completed, and your ESL Certificate is mailed immediately. The final exam is fully based upon the ExpertRating Online ESL Writing Courseware that is provided along with the ESL Certification. If you have gone through the courseware properly you should not have a problem clearing the exam. The exam consists of multiple choice questions from all chapters of the ExpertRating Online ESL Writing Courseware. English is used extensively as a second language and as an official language throughout the world, especially in Commonwealth countries and in many international organizations. There are four skills which are required for communication, namely; reading, listening, speaking and writing. Writing English includes writing for newspapers, magazines or writing resumes, cover letters, essays, business documents and much more. The Writing for ESL course will help you overcome your grammar problems, idioms and other academic problems. The Online ESL course will help you make your writing effective by teaching you about the adjectives to make your writing interesting, information on the structure of paragraphs and compositions and about different types of compositions. The ExpertRating Online ESL course will make you adept with writing by providing you with the necessary tools and tips of writing. Knowing how to write well is one of the most important skills you can have, whether you're writing e-mails and letters at work or essays and research papers in school. The first lesson will explore the key differences between speaking and writing plus a few techniques for continually improving your writing throughout your life. But there's more! You'll also understand the whole process of writing, starting with the prewriting stage and going all the way through the editing stage. You'll see that you truly can master writing in English, and this lesson will show you how! Do you ever struggle with not knowing what to write about? Many people do. In lesson 2 you'll learn two effective methods for generating all the ideas you need: brainstorming and clustering. Then, once you have your ideas, you need to organize them. You'll do this in the outlining stage. An outline is like a detailed map of where you want to take readers in your writing. When your outline is finished, you're ready to begin writing. So, this lesson will also examine two crucial elements of any written piece: the topic sentence and paragraphs. In this lesson, you'll learn all about how to write effective essays. Why should you learn about this particular form of writing? The essay form will hone your writing and thinking skills, helping you develop and connect your ideas in a clear, logical, focused way. You can certainly apply these skills in any setting! A vital component of all essays is the thesis statement, so you'll spend a lot of time exploring this. When you finish with this lesson, you'll be able to write strong thesis statements that will set a sure course for your essays. Now it's time to try out what you've learned so far about essays! In this lesson, you'll learn about three different essay types: descriptive, narrative, and explanatory. Each type has its own distinct purpose. Descriptive essays have vivid details that help your readers get involved in what you're writing. Narrative essays tell stories, starting at the beginning and moving logically to the end. Explanatory essays allow you to explain something you know about to your readers. This lesson has provided lots of examples to show you how to write each kind of essay. You'll have fun with these! You'll be able to apply the essay styles you learned about in the previous lesson to many other kinds of essays, including the one you'll learn about in this lesson: the compare and contrast essay. These essays let you examine, describe, and explain the similarities and differences between at least two topics. Additionally, you'll get acquainted with the importance of transitions and see what they can do for your writing. Rest assured—this lesson will provide you with lots of examples to walk you through how to write these very interesting pieces. Have you ever struggled to explain to your child what the effects of a certain course of action would be? Or have you ever tried to explain to your boss how one thing caused something else to happen? You may not have realized it, but you were engaging in the logical thinking required to understand cause and effect relationships. In lesson 6, you'll sharpen your logical skills by learning how to write cause and effect essays. Sometimes you'll analyze how one cause produced several different effects. At other times, you'll analyze how one effect had several causes. Once again, this lesson will provide you with sample essays that will point the way in your own writing. 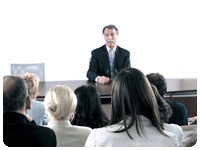 Do you feel confident in presenting or defending your opinions? In this lesson, you'll acquire one of the most important skills in writing: how to argue your point of view convincingly. You'll learn how to develop a sound thesis, organize your supporting evidence, and explain your argument fairly and persuasively. Most important, you'll learn how to think critically, as well as recognize and avoid fallacies. This will be a most interesting lesson, and as always, this lesson will provide you with many examples to guide you along your way. Native English speakers and writers often struggle with verbs, so this tricky area will be something ESL learners will want to be extra careful about. Verbs can be the most powerful words in your sentences, but if you don't use them correctly, they become powerfully confusing. Lesson 9 will examine verb tenses and inflections, subject-verb agreement issues, and active vs. passive voice. When you finish this lesson, you'll use verbs with confidence! Having spent the entire previous lesson looking at verbs, you now need to learn about the other parts of speech. So this lesson will review important features of nouns and pronouns, adjectives and adverbs, prepositions, and conjunctions. Next this lesson will look at the three types of clauses: noun, adjective, and adverb clauses. Finally, you'll gain another important technique for trimming wordiness: reducing clauses to simple phrases. The last lesson will focus on punctuation, paying special attention to the helpful but often misused comma. In addition, you'll learn how to skillfully use semicolons, colons, and dashes, along with the concluding punctuation marks. Next, you'll see how you can apply what you've learned about academic writing to your workplace. Finally, you'll wrap everything up with a review of the key points of the course. You should be very proud of all that you've learned!